IF SOMEONE asked you, May I have a look at your nails? how would you react? Would you gladly show your well-kept nails, or would you immediately hide your hands behind your back? You might have good reason to hide your nails. Maybe they just do not look nice, or perhaps you are a nail biter. Knowing more about the marvelous anatomy of our nails will help us to appreciate them better and can motivate us to take good care of them. As part of our wonderful body, our nails should be properly cared for. If you have a serious nail disorder, you should see your doctor. As a matter of fact, at the tip of your fingers, you may have signs of some physical problem. Yes, it is claimed that some physical ailments can be determined by looking at your nails. Would an extra intake of calcium or vitamins make nails stronger? In answering this question, Professor Bo Forslind, a researcher on the subject of nails at the Karolinska Institute in Stockholm, Sweden, said: There is no evidence available to support that view. Analyses of the calcium content in normal nails show only traces of this element. What definitely helps to keep your nails strong and flexible, though, is water. As mentioned before, nails contain keratin. These keratin strands need water to be flexible. Professor Forslind gives an example: Although a piece of your nail may be flexible when you first cut it, the same nail clipping will be very brittle when it has dried overnight. Moisture will keep your nails flexible and strong. But where does this moisture come from? The nail plate appears solid, but it is permeable. Moisture from the nail bed moves upward through the nail plate to its surface, where it evaporates. What can be done to prevent the nails from drying out and to keep your nails strong? Professor Forslind says: Daily treatment with oil will be beneficial. Since the nail grows from the matrix, proper care of this part of the nail is essential. Stimulating the matrix by regular massaging with cream or oil can benefit the nail plate. In addition, putting a drop of oil under the free edge of the nails can also be helpful, as it keeps the nail from drying out. The way you file or cut your nails can make them strong or weak. It is recommended that you file your nails from the side toward the middle. Keep in mind that filing the corners away will weaken the nail. This will create a pointed nail, which is the weakest shape of all, since it has no support on the sides. For strong short nails, it is recommended that you let your nails grow straight out to about 1/16 inch at the sides and file a round shape that follows the contour of the fingertip. Never, say the experts, pick your nails with a sharp tool. This can cause damage to the hyponychium, the tissue underneath the free edge of the nail. This tissue forms a tight seal protecting the nail underneath. If this area is damaged, the nail might even separate from the nail bed and become infected. To clean under the nails, use a very soft brush. At first glance you may think of the nail as just one piece, the nail plate. You might therefore be surprised to learn that nails may be considered to have a number of major visible parts as well as some that you cannot see. Let us take a closer look at the nail structure. This is the hard structure we normally refer to as the nail. The nail plate consists of two layers, the upper and the lower. The cells in these two parts are arranged differently and grow at different speeds. The upper surface is smooth, while its inner surface has parallel crests that correspond to ridges on the nail bed. These ridges are unique in each individual and may serve as a means of identification. This is the half-moon shaped whitish part at the base of the nail plate. Not all fingers have a visible lunule. 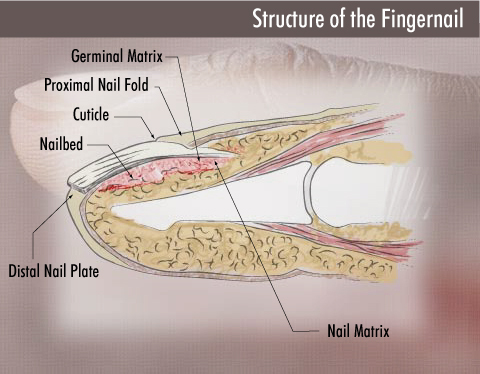 The nail grows from a small area of living tissue at the base of the nail plate, called the matrix. This is the most vital part of the nail unit. The lunule is the end of the nail matrix and, as such, the visible part of the living nail. The rest of the nail plate is composed of dead cells. 3. Nail folds, proximal and lateral. These refer to the skin surrounding the nail plate. This skin is called the nail fold because it does not end at the nail plate but folds under and covers the emerging nail plate. These skin folds protect and support the surrounding areas of the nail. This is the tiny strip of the skin fold that appears to end at the base of the nail plate. At times, this is referred to as the cuticle. The true cuticle is a tiny extension underneath the eponychium. It is a colorless layer of shed skin that adheres to the surface of the dorsal nail plate. 6. Free edge. The part of the nail plate that grows beyond the fingertip. 7. Hyponychium. Found underneath the free edge of the nail, this tissue forms a watertight seal that protects the nail bed from infection. 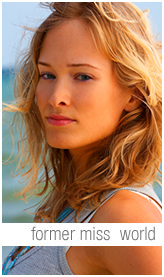 Discoveryou.biz has nail care, natural nail care, and nail care products. Discoveryou.biz has nail care, manicure, and natural nail care products.